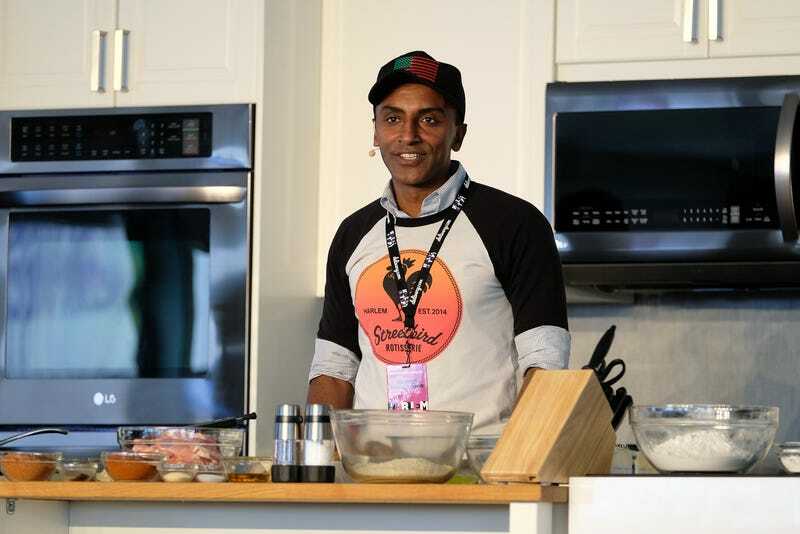 Red Rooster’s chef and owner, Marcus Samuelsson, attends Harlem EatUp! : The Sunday Stroll at Morningside Park on May 22, 2016, in New York City. Another well-known Harlem restaurant has been hit with a major lawsuit, this time alleging racial discrimination and wage theft. Marcus Samuelsson, the celebrity chef and restaurateur of the famed Red Rooster in Harlem, who has commented frequently about the lack of diversity in the restaurant industry, is being sued by one of his former bartenders, Campus Johnson. In a lawsuit filed Friday at a Manhattan federal court, Johnson claims that there is a “plain aversion to black bartenders” at Samuelsson’s establishment. Johnson, who worked at Red Rooster from 2014 to March 2018, is basing his racial discrimination case on the lack of black male bartenders at the restaurant. As Eater reports, Johnson says that when he was promoted to a position behind the bar in 2016, he was the only black male bartender out of 10 most of the time. While there were black female bartenders, they were “in the clear minority,” the suit adds. Johnson also alleges wage theft in his suit, saying that the restaurant “routinely” tipped him out the wrong amount and docked 30 minutes each shift for a meal break—even if he wasn’t able to take one that day, something which happened often, the suit claims. The ex-bartender also notes that he was fired two days after being approved to take a two-month leave to care for his mother, who has leukemia. The reason the restaurant gave for Johnson’s firing, according to his suit, was that he had failed to “properly moderate his drink pouring,” as Eater writes. “Marcus Samuelsson Group is minority-owned and -operated, and the majority of staff is African American men and women,” Richmond wrote. Earlier last week, the former employee of another popular Harlem eatery, Corner Social, filed a $6 million lawsuit claiming that she had been sexually harassed multiple times by different employees at the restaurant, including the chef and a manager. Corner Social owner Anahi Angelone’s other restaurant, Angel of Harlem, also made the wrong kinds of headlines recently after patrons accused the staff of racially profiling them. Johnson is being represented by lawyer Maimon Kirschenbaum, who specializes in the restaurant industry and has launched successful wage-theft suits against other high-profile restaurants, including Mario Batali’s Babbo. He’s seeking class action status on this lawsuit.